Brakeoil is a type of hydraulic fluid used in hydraulic brake and hydraulic clutch applications in automobiles, motorcycles, light trucks, and off-road vehicles. Brakeoil is renewed or changed every one to two years in off-road vehicles in order to improve the safety and durability of vehicles. Thus, the brakeoil aftermarket has been expanding across the globe. Newly developed state-of-the-art brakeoil offers better performance reliability with efficient results. Glycol fluids are the most commonly used in most motor vehicles in various grades. They are named by the Department of Transport (DOT) coding and are classified into DOT 3, DOT 4, DOT 5, and DOT 5.1. Rise in mining and construction activities is driving the off-highway brakeoil aftermarket. The frequency of oil change and other maintenance is expected to increase with the growth in age of off-highway vehicles such as heavy trucks and mining vehicles. Vehicles require brakeoil change to ensure safety of the passengers and maintenance of the vehicle for long life and high efficiency. Brake oil level may also be low because of a leak. This could result in a loss of hydraulic pressure. Consequently, this may lead to significant loss of braking ability. Modern vehicles have split hydraulic circuits to ensure against total hydraulic failure. Brakeoil has a limited life, not only because of water absorption but due to the depletion of corrosion inhibitors and stabilizers over time. Wear particles and rubber fragments also build up gradually. Rise in demand for e-vehicles is one of the restraints of the brakeoil aftermarket in Europe. The usage of electric vehicles for mining, agriculture, and construction is increasing at a rapid pace. Brake oil plays an important role in the efficient operation of the braking system and in turn the safety of the vehicle. The U.S. continues to be the leading country in terms of consumption of brake oil due to the implementation of stringent government regulations on the servicing of vehicles in order to maintain safety and lower harmful emissions. India follows China in long-term growth of the brakeoil aftermarket due to its rapidly growing economy. Southeast Asia is also a key region of the off-highway brakeoil aftermarket due to the expansion in the automobile industry in the region. Key factors that promote the brake oil aftermarket are increasing due to stringent emission & fuel consumption norms imposed by several governments and more exacting OEM specifications. Opportunities in the development of next generation brakeoil with better efficiency and advanced technology are under process. Companies such as Bosch and Exxon are engaged in developing brake oil with advanced technologies. In January 2018, Lukoil signed a contract with Elabuga car plant (ELAZ), Turkey, wherein the former will supply first fill lubricants for ELAZ-BL backhoe loaders. The company will also supply a wide spectrum of hydraulic, motor, transmission, and universal tractor oils. In October 2017, Lukoil entered into a strategic partnership with the Russian Export Center. The partnership aims to provide full scale support to Lukoil in promoting its high-end lubricants and oil manufacturing technology in foreign markets. This is expected to expand Lukoil’s business across the globe. In 2016, LUKOIL launched the construction of a lubricants plant in Kazakhstan the capacity of 100 thousand tons per year to be engaged in blended lubricant production. The plant is scheduled for commissioning in 2018. This is estimated to expand the company’s business in Europe. In 2017, Phillips 66 launched T5X® off-road mobile high-performance hydraulic fluid, which is likely to be beneficial in the hydraulic systems of Caterpillar and other off-highway mobile equipment. Recently, Royal Dutch Shell launched its Rimula’s adaptive technology, which provides outstanding wear protection with reduced viscosity for improved fuel efficiency for off-road heavy vehicles. In terms of revenue and volume, Asia Pacific held large share of more than 30% of the global off-highway brakeoil aftermarket in 2016. Countries such as China, India, Vietnam, and Indonesia are experiencing major economic and infrastructure development. This can be ascribed to the rapid industrialization in the region. India, China, and Australia are dominant countries in the mining of minerals, metals, non-metals, and ores. Globally, Australia is ranked second in terms of year-on-year mining of gold. Furthermore, these countries employ majority of off-highway mining vehicles. This is anticipated to boost the market in the near future. The global off-highway brakeoil aftermarket is a highly competitive. The leading players dominate the market. Key players in the off-highway brakeoil aftermarket are BRB International BV, Halron Lubricants Inc., Lukoil Lubricants Company, Phillips 66 Lubricants, Royal Dutch Shell plc., Indian Oil Corporation Limited, Castrol Limited, Chevron Corporation, BP plc., Total S.A., ExxonMobil Corporation, Fuchs Petrolub SE, and Topaz Energy Group Ltd. Brake fluid is a type of hydraulic fluid used in hydraulic brake and hydraulic clutch applications in automobiles, motorcycles, light trucks, and off-highway vehicles. It is used to transfer force into pressure and to amplify braking force. Aftermarket parts are replacement parts that are made by a company other than the original manufacturer. Brakeoil needs to be replaced every one to two years for the safety and durability of vehicles. Various types of off-highway brakeoil for aftermarket services include DOT3, DOT 4, DOT 5, and DOT 5. The DOT 5 segment dominated the off-highway brakeoil aftermarket in 2016. The segment is anticipated to continue its dominance during the forecast period. Asia Pacific led the off-highway brakeoil aftermarket in terms of volume and revenue in 2016. This trend is estimated to continue during the period of forecast. Increase in use of off-highway brakeoil in the mining sector is one of the factors boosting the demand for brakeoil. Rise in awareness about benefits of safety and durability of vehicles is projected to drive the demand for brakeoil during the forecast period. Led by safety considerations in off-highway vehicles, regulatory authorities and market players are emphasizing more on the usage of DOT 5 brakeoil in order to have less impact of boiling point on vehicles used in rough terrains. Market share of the DOT 5 segment is likely to increase by 2025. This report analyzes and forecasts the off-highway brakeoil aftermarket at the global and regional level. The aftermarket has been forecast based on volume (tons) and revenue (US$ Mn) from 2017 to 2025, considering 2016 as the base year. The study includes drivers and restraints of the global off-highway brakeoil aftermarket. It also covers impact of these drivers and restraints on demand for off-highway brakeoil during the forecast period. The report also highlights opportunities in the off-highway brakeoil aftermarket at the global and regional level. The report includes detailed value chain analysis, which provides a comprehensive view of the global off-highway brakeoil aftermarket. Porter’s Five Forces model for the off-highway brakeoil aftermarket has also been included to help understand the competitive landscape. The study encompasses market attractiveness analysis, wherein products and application are benchmarked based on their market size, growth rate, and general attractiveness. 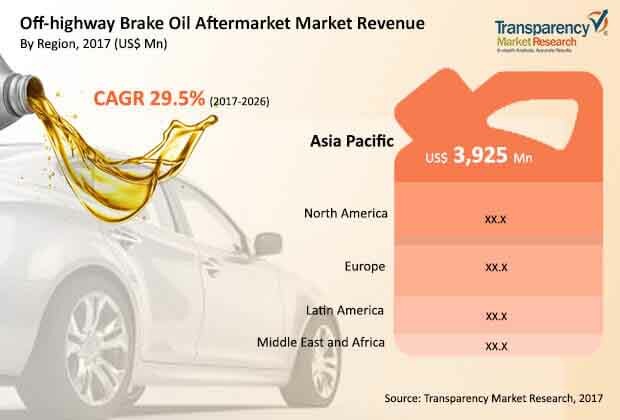 The study provides a decisive view of the global off-highway brakeoil aftermarket by segmenting it in terms of type, end-user industry, and region. In terms of type, the off-highway brakeoil aftermarket has been classified into DOT 3, DOT 4, DOT 5, and DOT 5.1. Based on end-user industry, the off-highway brakeoil aftermarket has been divided into mining, construction, agriculture, and others. These segments have been analyzed based on present and future trends. Regional segmentation includes current and forecast demand for off-highway brakeoil in North America, Europe, Asia Pacific, Latin America, and Middle East & Africa. The report provides the actual size of the off-highway brakeoil aftermarket for 2016 and estimated size for 2017 with forecast for the next eight years. The global market of off-highway brakeoil aftermarket has been provided in terms volume and revenue. Market volume has been defined in tons and revenue in US$ Mn. Market numbers have been estimated based on type and end-user industry of the off-highway brakeoil aftermarket. Market volume and size have been provided in terms of global, regional, and country level markets. The report comprises profiles of major companies operating in the global off-highway brakeoil aftermarket. Key players operating in the off-highway brakeoil aftermarket include Royal Dutch Shell Plc., Exxon Mobil Corporation, Chevron Corporation, BP Plc., Lukoil Lubricants Company, Fuchs Petrolub SE, and Phillips 66 Lubricants. Market players have been profiled in terms of attributes such as company overview, financial overview, business strategies, and recent developments. The market for DOT 3 type of brakeoil is smaller as compared to the market for DOT 5, due to the consumer preference for silicone based brakeoil for off-highway vehicles. The end-consumer preference is shifting toward DOT 5 brakeoil for aftermarket services, owing to the rise in awareness about the safety of off-highway vehicles, especially used in rough terrains. The global mining sector prefers the use of brakeoil for off-highway vehicles. The construction sector prefers the use of off-highway brakeoil for the purpose of infrastructure development and real estate to meet the needs of the rising population. The agriculture sector is anticipated to expand at a faster pace during the forecast period. Asia Pacific is anticipated to dominate the market during the forecast period.